xarray is an open source project and Python package that provides a toolkit and data structures for N-dimensional labeled arrays. Our approach combines an application programing interface (API) inspired by pandas with the Common Data Model for self-described scientific data. Key features of the xarray package include label-based indexing and arithmetic, interoperability with the core scientific Python packages (e.g., pandas, NumPy, Matplotlib), out-of-core computation on datasets that don’t fit into memory, a wide range of serialization and input/output (I/O) options, and advanced multi-dimensional data manipulation tools such as group-by and resampling. xarray, as a data model and analytics toolkit, has been widely adopted in the geoscience community but is also used more broadly for multi-dimensional data analysis in physics, machine learning and finance. Python has emerged as a leading programing language for both the physical sciences and data sciences. At the core of modern scientific computing and analysis in Python are the NumPy  and SciPy  packages, which provide a robust N-dimensional array object and the fundamental operations required for science and engineering applications. Much of the success of Python in data science and business analytics is due to pandas , which introduced intuitive and fast tabular data analysis tools to Python, inspired by R’s data.frame . The pandas DataFrame and Series objects provide unparalleled analysis tools for data alignment, resampling, grouping, pivoting, and aggregation in Python. xarray implements data structures and an analytics toolkit for multi-dimensional labeled arrays strongly inspired by pandas. While pandas includes a data structure called the Panel for three dimensional data, its fixed rank design make it unsuitable for applications that require arbitrary rank arrays. Additionally, many of the features that make the pandas DataFrame and Series objects so useful, are not fully available on the Panel. Our approach with xarray adopts Unidata’s self-describing Common Data Model on which the network Common Data Form (netCDF) is built [20, 7]. NetCDF provides a well-defined data model for labeled N-dimensional array-oriented scientific data analysis. xarray builds on top of, and seamlessly interoperates with, the core scientific Python packages, such as NumPy, SciPy, Matplotlib , and pandas. xarray provides a range of backends for serialization and input/output (IO), including the Pickle, netCDF, OPeNDAP (read-only), GRIB1/2 (read-only), and HDF file formats. Leveraging the dask parallel computing library , xarray can optionally perform efficient parallel, out-of-core analysis on datasets that are too large to fit into memory. Finally, xarray interfaces with existing domain-specific packages such as UV-CDAT , Iris , and Cartopy . Scientific data is inherently labeled. For example, time series data includes timestamps that label individual periods or points in time, spatial data has coordinates (e.g. longitude, latitude, elevation), and model or laboratory experiments are often identified by unique identifiers. Figure 1 provides an example of a labeled dataset. In this case the data is a map of global air temperature from a numeric weather model. The labels on this particular dataset are time (e.g. “2016-05-01”), longitude (x-axis), and latitude (y-axis). An example of a multidimensional labeled array. 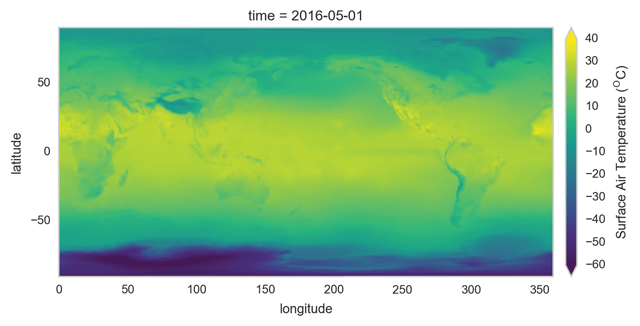 This figure (map) is showing the global surface air temperature for May 1, 2016 from ERA-Interim Reanalyis . The map is labeled with the array's coordinates: longitude and latitude. Unlabeled, N-dimensional arrays of numbers (e.g., NumPy’s ndarray) are the most widely used data structure in scientific computing. However, they lack a meaningful representation of the metadata associated with their data. Implementing such functionality is left to individual users and domain-specific packages. As a result, programmers frequently encounter pitfalls in the form of questions like “is the time axis of my array in the first or third index position?” or “does my array of timestamps still align with my data after resampling?”. The core motivation for developing xarray was to provide labeled data tools for N-dimensional arrays that render such questions moot. Every operation in xarray both relies on and maintains the consistency of labels. The network Common Data Form is a collection of self-describing, machine-independent binary data formats and software tools. These data formats and tools facilitate the creation, access, and sharing of scientific data stored in N-dimensional arrays, along with metadata describing the contents of each array . NetCDF has become very popular in the geoscience community, and there are existing libraries for reading and writing netCDF in many programming languages, including C, Fortran, Python, Java, Matlab, and Julia. The principal data structure in the netCDF data model is the dataset. Each netCDF dataset contains dimensions, variables, and attributes, each of which are identified by a hierarchy of unique names. The dataset and variable objects may contain attributes that describe the contents, units, history, or other metadata of the object. Standardized conventions, such as the Climate and Forecast (CF) Conventions , allow for the associations of coordinate variables with dimensions. NetCDF forms the basis of the xarray data model and provides a natural and portable serialization format. Building on netCDF, xarray features two main data structures: the DataArray and the Dataset. The API for these data structures is summarized in the following sections and in Figure 2. An overview of xarray’s main data structures. Types are annotated using Python 3 style type hints . “Mapping of” denotes an ordered mapping with values of the given type. name: an arbitrary name for the array. xarray uses dims and coords to enable its core metadata-aware operations. Dimensions provide names that xarray uses instead of the axis argument found in many NumPy functions. Coordinates are ancillary variables used to enable fast label based indexing and alignment, building on the functionality of the pandas Index. DataArray objects also can have a name and can hold arbitrary metadata in the form of their attrs property, which can be used to further describe data (e.g. by providing units). Names and attributes are strictly for users and user-written code; in general xarray makes no attempt to interpret them, and propagates them only in unambiguous cases. In contrast, xarray does interpret and persist coordinates in operations that transform xarray objects. attrs: OrderedDict to hold arbitrary metadata pertaining to the dataset. DataArray objects inside a Dataset may have any number of dimensions but are presumed to share a common coordinate system. Coordinates can also have any number of dimensions but denote constant/independent quantities, unlike the varying/dependent quantities that belong in data. Figure 3 illustrates these concepts for an example Dataset containing meteorological data. An example of how a dataset (netCDF or xarray) for a weather forecast might be structured. This dataset has three dimensions, time, y, and x, each of which is also a one-dimensional coordinate. Temperature and precipitation are three-dimensional data variables. Also included in the dataset are two-dimensional coordinates latitude and longitude, having dimensions y and x, and reference time, a zero-dimensional (scalar) coordinate. xarray includes a powerful and growing feature set. The following list highlights some of the key features available in xarray. The xarray documentation  includes a complete description of available features and their usage. Label-based indexing: Similarly to pandas objects, xarray objects support both integer- and label-based lookups along each dimension. However, xarray objects also have named dimensions, so you can optionally use dimension names instead of relying on the positional ordering of dimensions. Arithmetic: arithmetic between xarray objects vectorizes based on dimension names, automatically looping (broadcasting) over each distinct dimension. This eliminates the need to insert dummy dimensions of size one to facilitate broadcasting, a common pattern with NumPy. Aggregation: calculation of statistics (e.g. sum) along a dimension of an xarray object can be done by dimension name instead of an integer axis number. Alignment: xarray supports database-like join operations for combining xarray objects along common coordinates. Split-apply-combine: xarray includes N-dimensional grouped operations implementing the split-apply-combine strategy . Resampling and rolling window operations: Utilizing the efficient resampling methods from pandas and rolling window operations from Bottleneck , xarray offers a robust set of resampling and rolling window operations along a single dimension. Plotting: xarray plotting functionality is a thin wrapper around the popular Matplotlib library. xarray uses the syntax and function names from Matplotlib whenever possible, resulting in a seamless transition between the two. Missing Data: xarray smoothly handles missing data in all operations, including arithmetic, alignment and aggregation. Interactivity with pandas: xarray objects seamlessly to convert to and from pandas objects to interact with the rest of the PyData ecosystem. Serialization and I/O: xarray supports direct serialization and I/O to several file formats including pickle, netCDF, OPeNDAP (read-only), GRIB1/2 (read-only), and HDF by integrating with third-party libraries. Additional serialization formats for 1-dimensional data are available through pandas. Out-of-core computation: xarray’s data structures can be backed by dask  instead of NumPy to support parallel and streaming computation on data that does not fit into memory, up to 100s of GB or TBs in size. Such large datasets (“big data”) are increasingly prevalent in science. xarray is provided with a large test suite comprised of over 1,500 unit tests. These tests cover the core xarray functionality as well as features facilitated by optional dependencies. The unit tests are executed automatically on the TravisCI (Linux)  and Appveyor (Windows)  continuous integration systems. A selection of sample data is also distributed with the source code, allowing users to reproduce any examples in the xarray documentation. Linux, Windows and Mac OS X.
Python, versions 2.7, 3.4 and later. xarray is implemented in pure Python and relies on compiled dependencies for speed. Benjamin Root, Atmospheric and Environmental Research, Inc.
xarray was written in a modular, objected-oriented way, to build upon and extend the core scientific Python libraries in a domain-agnostic fashion. The xarray documentation is complete with a wide range of examples and a number of tutorials that use real-world datasets that are available in the xarray repository. We have intentionally avoided including domain-specific functionality in the library, leaving that to third party libraries. It has been widely adopted in the geoscience community [e.g. 6, 10, 9], but has also been used in physics [e.g. 3], time series analytics , and finance. The core xarray data structures (the DataArray and the Dataset) are extensible through subclassing or the preferred approach of composition. We also provide an extensible high-level accessor interface to allow users to implement domain specific methods on xarray data objects. xarray is developed and supported by a team of volunteers. The primary avenue for user support is StackOverflow , with the “xarray-python” tag. Additionally, we use GitHub for a bug tracker (https://github.com/pydata/xarray/issues) and maintain the “xarray” mailing list on Google Groups (https://groups.google.com/forum/#!forum/xarray). Initial development of xarray was supported by The Climate Corporation. We thank Matthew Rocklin and Jim Crist for their assistance integrating xarray with Dask, and Todd Small, Francisco Alvarez and Fabien Maussion for their feedback on early drafts of this manuscript. Appveyor (). https://ci.appveyor.com. Accessed: 2015-06-12.
xarray documentation. http://xarray.pydata.org. Accessed: 2017-01-30.
pycalphad: Computational thermodynamics. http://pycalphad.readthedocs.io. Accessed: 2015-06-12. Stack overflow (). http://stackoverflow.com/questions/tagged/python-xarray. Accessed: 2015-06-12. Travis CI – test and deploy your code with confidence. https://travis-ci.org. Accessed: 2015-06-12.
xgcm: General circulation model postprocessing with xarray. http://xgcm.readthedocs.io. Accessed: 2015-06-12. Dawson, A, Irving, D, Filipe and Russo, A (2016). windspharm: Version 1.5.0. Eaton, B, Gregory, J, Drach, B, Taylor, K, Hankin, S, Caron, J, Signell, R, Bentley, P, Rappa, G and Höck, H (2003). NetCDF Climate and Forecast (CF) metadata conventions. Jones, E Oliphant, T Peterson, P et al. (2001). SciPy: Open source scientific tools for Python. [Online; accessed 2015-11-06]. McKinney, W (2010). van der Walt, S and Millman, J eds. Data Structures for Statistical Computing in Python. Proceedings of the 9th Python in Science Conference. : 51–56. R Core Team (2013). R: A Language and Environment for Statistical Computing. Vienna, Austria: R Foundation for Statistical Computing. Rocklin, M (2015). Huff, K and Bergstra, J eds. Dask: Parallel computation with blocked algorithms and task scheduling. Proceedings of the 14th Python in Science Conference. : 130–136. van Rossum, G, Lehtosalo, J and Langa, L (2016). PEP 484 – type hints. https://www.python.org/dev/peps/pep-0484/. Accessed: 01–24. Williams, D N Doutriaux, C Fries, S Lipsa, D Painter, J McEnerney, J Chaudhary, A Jhaveri, S Maxwell, T Durack, P J et al. (2016). UV-CDAT 2.4.1.